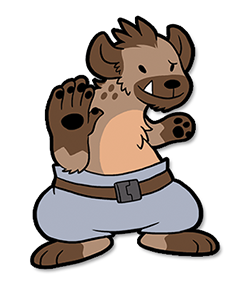 Lucky is the leader of her tiny hyena clan. 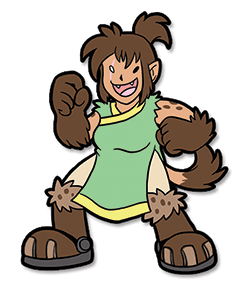 Her jobs at the diner are offering her repair services as a mechanic, bouncing troublemakers, and hunting for meat. Unlike her older brother, she will eat pretty much anything with gusto. Lucky and Guff are directly related and have the same parents. Mutants are just like that. The older brother of Lucky. Transmasculine. He is the diner’s cook, and is equally fussy about the food he eats and the food he makes for his customers. Guff values cleanliness and enjoys gardening. Despite his innate physical strength, he dislikes fighting and dangerous situations. 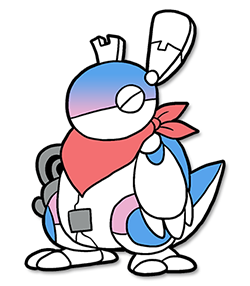 Bailey is a robot that Lucky assembled from parts she found in the Junk Sea. Bailey does not remember anything about their past, and is determined to someday discover the purpose of their existence. In the meantime, they live with Lucky and Guff and helps as their assistant. They enjoy the work and the siblings’ company more than they care to admit.